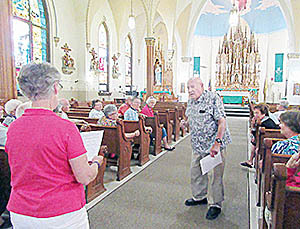 Marion (l.-r.) and Jack Kunzman presented information about St. Michael’s Church to a group of 57 visitors who were part of a Moostash Joe tour visiting seven Catholic churches in Northeast Nebraska. A history of Catholic churches in Northeast Nebraska was the focus of a recent Moostash Joe bus tour that stopped in at St. Michael’s Church here. 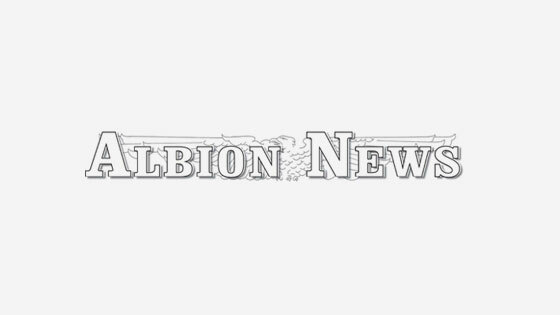 A group of about 57 people were in Albion Wednesday, June 28, to admire the beautiful church and receive a tour of St. Michael’s from Jack and Marion Kunzman. Other area churches visited by the tour group were St. Francis of Assisi in Humphrey, St. Anthony’s in Cedar Rapids, St. Michael’s in Spalding, St. Bonaventure in Raeville, St. Boniface in Elgin, and St. Francis Parish in Neligh.